Rev. Cindi Knox is pastor of St. John’s United Church of Christ in Evanston, IL and a contributing editor at revgalblogpals.org. 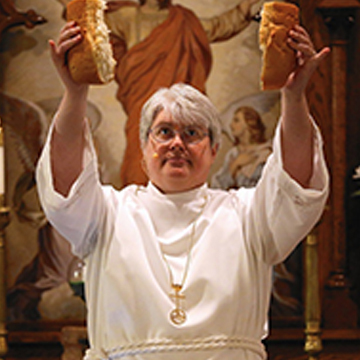 A 2013 graduate of Chicago Theological Seminary, her emphases were ministry with people on the margins of church and society, and working with new and renewing congregations. Cindi is a woman of transsexual history, transitioning in 1986, and met her wife Mary in 1989. She has one daughter, a stepdaughter, and two step-grandchildren. For fun she plays guitar and takes long distance motorcycle trips. Her sermons and occasional theological rants are at revcindi.com. I am the one-quarter time pastor of a struggling little formally German Evangelical church in Evanston, where we have 12 to 15 during worship on Sunday and we’re currently in the process of trying to find what God is calling this church to be next, to find its mission. This is a church that started out with a mission of being a church for German immigrants, German-speaking people who were more connected to the Prussian Union Church in Germany. There was a new mission just after World War II with new immigrants coming in and this being again a place where immigrants could find a place that felt like home. Another mission was when it became a multigenerational church, so this was a church where families had grown up in, but at this point none of those missions are going to resonate, so we need to figure out what this church is going to grow into. What led you to pursue ministry? When I was just a little child in the Evangelical Free Church, I thought I might grow up to be a minister, but bullying kind of drove me out of the Evangelical Free Church. But it is something that had been on my mind for a very, very long time. I was involved with Sunday school and church camp and vacation Bible school and youth groups. So I was very involved in the church as a youth. When I came back to the church with my now spouse in the 90’s, all of those commitments came back again, how much I loved talking to people about God and Jesus and also about what it meant to be Christian and how to live out that call. It was in the 90’s when that all came back and now 17 years later, here I am. CTS is really cool because there’s this bunch of electives that really helped a whole bunch. I’ve taken classes in renewing congregations, which is incredibly valuable here. These classes really helped me to learn how to connect with folks in a context other than ‘Well, here’s your neighborhood church and here are the families that go to your church.’ I wanted something that was broader than that. I think the core education at CTS is really strong in that, rather than giving doctrine like some seminaries do, its historical connection to the United Church of Christ and all of the other denominations that are represented at CTS, we get a wide variety of theologies and I think that’s really valuable because it helps us to be a little bit nimbler in dealing with actual constructive theology on the streets in the neighborhoods. What advice would you give incoming CTS students? The first two words I would say are: don’t panic. During my first semester at CTS, I was really struggling, really afraid that I was just going to be a wash out. It can be a little bit overwhelming, regardless of where you’ve come from, just because of all of the different directions things come from, all of the different ways the professors teach. You’re probably going to meet a professor that connects with you so well that you wish every class was with that person and probably a professor that doesn’t connect with you very well at all and you just wonder how you’re going to get through the class. I think everybody gets those, but it’s not the same professor for everybody. I think the main thing is don’t panic. If you have a professor that just doesn’t seem to be connecting very well with you, talk with your classmates, talk with other professors, talk with your advisor, and see if you can get handle on the topic you’re studying, but know that every professor isn’t going to be difficult or great for you individually. Just keep working on it and I think overtime you’ll get more comfortable. What was your most significant CTS experience? During my time, I worked on putting together a Pride breakfast and evening worships for students who could not attend Wednesday worships during the day. As far as classes go, Ted Jenning’s Eating and Drinking with Jesus was really important to me and one of the most important classes for me in terms of worship was Scott Haldeman’s Leading Worship class. I think the most valuable things I have learned from him and use every Sunday are two things: he taught me that everything matters, so everything in worship does matter, and that there are no fatal flaws, and that has gotten me through many a Sunday morning where something has seemingly gone wrong but it has not destroyed Sunday morning because of that mantra. Everything matters. There are no fatal flaws. It’s a lot of different things, depending on how you look at it. It’s experiences I had outside the classroom, experiences I had inside the classroom. There’s a lot that happens at CTS. It’s kind of a tie for different reasons. One is Christopher Moore’s Lamb, which is just a wonderful book about what the intervening years of Jesus’ life might have been like before going into ministry and then another take on the years of ministry, which has a take on crucifixion which is essentially moving and captures the feeling of futility and fatalism the disciples must have felt at that moment. The other one is Heidi Neumark’s Breathing Space, it’s just such a brilliant story of what it means to actually reach out to people who have been taught that they are not welcomed in church, they don’t belong in the church, they’re not good enough to be in the church, and what it’s like to actually reach out to people who are afraid of the church. Two books for completely different reasons. The thing that probably makes everything a little more difficult for me is I’m a transgender person. There are not a lot of transgender women in ministry. Most of the ones who are ordained were ordained before transitioning and just carried the ordination through. For somebody who already had transitioned but is out about it, it is really difficult to get a call in parish ministry. It took me three years to get this one-quarter time call in Evanston. I think that’s probably the one thing that sets me apart. It doesn’t really affect the way that I do ministry, but I think my being out probably helps a bit for people who are transgender, especially the ones who have been told by their pastors that there’s something inherently wrong with them or they’re sinful. To see someone like me in the pulpit makes a little bit of difference to them.